February 17th, 2014 – Well, we’re finally having a bit of that mid winter thaw that usually occurs in January or early February each year. Temps are expected to top off in the low to mid 30’s, but just for a few days mid week. Grooming will most likely be restricted to nights only during this warm up to prevent loss of snow on the trails. However, it looks like we’re heading back into winter in time for this next weekend with highs in the teens and single digits and lows below zero with a snow storm expected later in the week. We have plenty of snow on the ground with an added accumulation over the last couple of days, including today, of about 4 to 6-inches of new snow. There is still a lot of great riding to be had this year so pack your bags, load up your sled and come on up for some great riding on the best trails in the area! Be sure to pick up a copy of the newest edition of the Gogebic Times, put out by the Lake Gogebic Area Chamber of Commerce, which can be found at most local businesses. Not only will you find a snowmobile map and a lake map but there are some really great articles about snowmobile riding in our beautiful area. Not to mention some really great articles about the Lake Gogebic area and lots of great information for year round fun. Take one or two home with you, there free of cost to you. That’s all for now from Carolyn at the Hoop. I will keep you posted as often as conditions change. For additional information about the Lake Gogebic area we invite you to visit the only official website of the Lake Gogebic Area Chamber of Commerce at www.LakeGogebicArea.com or call us at 1-888-464-3242 (888-GOGEBIC). From all of us here at Lake Gogebic have a great ride as well as a safe ride. February 13, 2014 – Gogebic Area Trails are in very good to excellent condition as we head into Presidents weekend, the last “holiday” weekend of the winter. And by holiday, I mean that there will likely be families up for the weekend and some of these kids may be inexperienced. Do your part by riding at a safe speed and always staying on your side of the trail at all times. The groomers have been busy knocking back corners where they’ve become banked up, making our trails even safer for riders in the area. No problems to report on any trails. We’re expecting perfect conditions over this weekend with high temps in the teens and night temps just below zero! We’ve received about 6-inches of new snow over the last 24 hours…all is good. We have a request to make; on a couple of instances recently our groomers have had to drive on a portion of a highway shoulder to get back to the groomer garage. Once was because the driver fell ill and once was because there was a mechanical issue with the groomer. Unfortunately some snowmobilers took this as an invitation to ride these roadways. You cannot ride along the highway, at anytime, anywhere for any reason. I’m happy to report less snowmobile traffic riding on the railroad tracks through Merriweather and Bergland. I know there are a lot of snowmobile tracks running on the railroad tracks and it can get confusing…but don’t follow blindly along other snowmobile tracks. When in doubt, look for trail signs. If you see a R/R sign, guess what? You’re on a railroad track! Get off of it ASAP!! You could get stuck on the tracks and you could get a ticket for riding on them. I know the R.R. tracks haven’t been in use for a number of years now but they are still considered “active”, so you never know when you might come nose to nose with a very large locomotive…not cool. Law enforcement has been out patrolling these areas and will ticket anyone found riding on the R/R tracks. So, the moral of this trail report is, once again, please stay on the marked trails! We go to a lot of effort and money to make sure these trails are kept in great shape for great riding. Watersmeet WebCam – Western U.P. 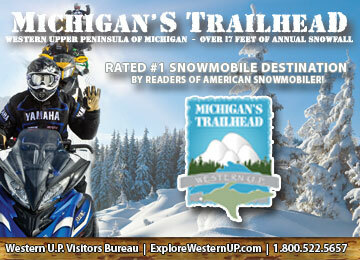 Northern Michigan Snowmobile - Snowmobiling in Northern Michigan and the Upper Peninsula - produced by North Guide Internet.